Lecture: "HOUSING. Heritage and Specificity"
Housing constitutes 80% of the city. It's a bit like water for the human body. We must therefore make this 80% exceptional. The life and richness of a city are its inhabitants, and every town and city across the world is looking for new solutions to supply to this demand. In this future production, we have the responsibility to achieve a high level of quality because it is the key for success in the creation of communities. We must consider two things in order to engender true identity in these communities: heritage and specificity. The creation of housing is a cultural act closely linked to the past. This is visible through old cities, which often tell a story. They are made up of different layers from different eras, creating an organic, complex, unpredictable environment, similar to an organism. We should not fear this complexity and unique heritage, as housing should be a product of culture. We should embrace the past instead of pursuing a reductive, minimalist response, which produces a predictable mass: a generic city. Heritage allows a certain specificity to develop, which is fundamental for housing solutions. Today political figures, urban planners and architects often employ words such as "flexibility" in order to propose solutions to today's housing crisis and urban planning dilemmas. This simplistic method has become contagious and has consequently lost all meaning. This is particularly visible in modern housing 'solutions'. This formulaic approach must be avoided, and new territories must seek specificity and recognise the notions of complexity and mutability. During his lecture, Jean-Christophe Masson, founding partner of Hamonic+Masson & Associés will use the office's housing projects in France as a prism through which to explore the idea of collectives and community. Jean-Christophe Masson was born in Marseille and later went on to graduate from France's École Nationale Supérieure d'Architecture de Paris-Belleville. He founded the architecture practice Hamonic+Masson with Gaëlle Hamonic in 1997, and since 2006 has taught in some of France's most prestigious architecture schools. He is also a founding member of the French Touch collective, which promoted and showcased inventive French architecture through the publication of numerous annuals and reviews. Jean-Christophe is a frequent guest speaker at international conferences and lectures, and writes regularly in the architectural press. Hamonic+Masson & Associés is Gaëlle Hamonic, Jean-Christophe Masson and, since 2014, Marie-Agnès de Bailliencourt. The practice was founded in 1997, was nominated for the Mies van der Rohe prize in 2001, and in 2002 was awarded the Nouveaux Albums de la Jeune Architecture (NAJA). The firm became recognised by the general public in 2003 by designing the Maison Métal for the Parc de la Villette. It was an event that placed Hamonic+Masson at the crossroads of art and architecture, a flexible place that allows for some adventurous undertakings. We have since opened a series of exhibitions and staged events such as co-curating the French Pavilion at the 2008 Venice Biennale and at the City of Architecture and Heritage, as well as participating in numerous international conferences. The practice intervenes in all sectors including housing, public facilities, retail, offices, infrastructure and urban design in France and internationally. It is presently participating in the debate on height that has become such a hot topic throughout France. 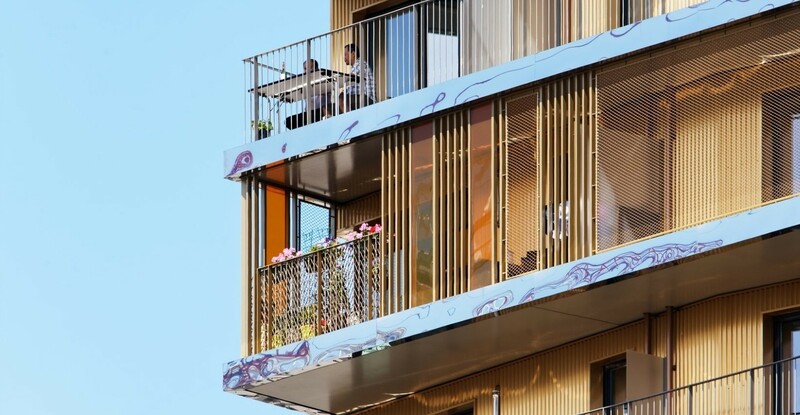 In 2015 the practice completed and delivered Paris' first housing project measuring 50m since the 1970s, in the city's Masséna district. Projects in the framework of the Grand Paris scheme are also currently being undertaken, notably the proposition for the Avenue Foch, which became one of the major projects backed by the Paris City Hall during Anne Hidalgo's 2014 campaign for the Mayor of Paris.